I would like to get some ideas as to how to take both tires off at the same time on '18 RT. Otherwise I am gonna have to take the long trip to my install place twice. Front lift stand + your center stand. Take rear off first, then front. 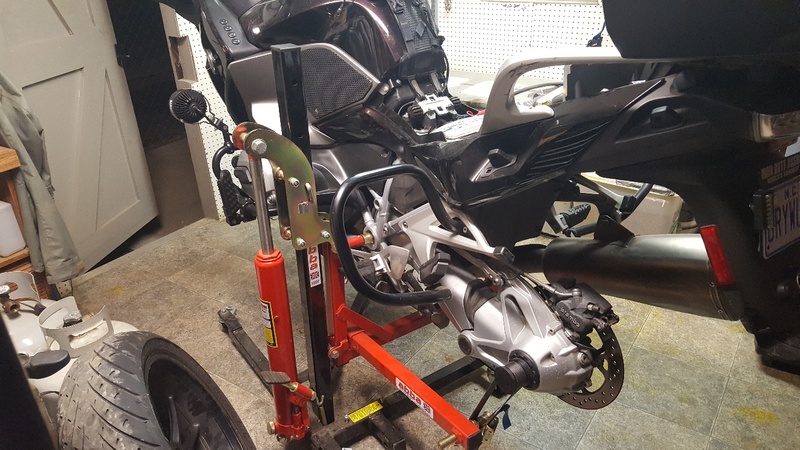 Put something under your swingarm so the bike doesn't tilt too far rearwards. Remove the muffler if needed to clear the wheel. Break the torque on the rear bolts. Loosen the front axle pinch bolt(s) and break the torque on the axle (I don't like to apply torque to loosen big bolts with the machine dangling off some jury-rigged supports but that's just me). Get a cinder block (or three or anything heavy) and use that to weigh down the rear end. Remove the front tire and reinstall the axle hand tight. Put a jack stand (or any sturdy item) under the axle and slowly lower the front end back down on to it. Don't pitch the bike too far forward or it might pop off the center stand (this would be bad). Then remove the rear tire. Reverse the procedure to reinstall. Last edited by Pappy53; Apr 5th, 2019 at 4:45 pm. Put bike on center stand. Place an adjustable jack stand under the final drive (with towel under it). Place a barbell or other weight of about 75 pound on rear seat or remove top case and place weight on rear platform. With front wheel now raised, finish removing front wheel. 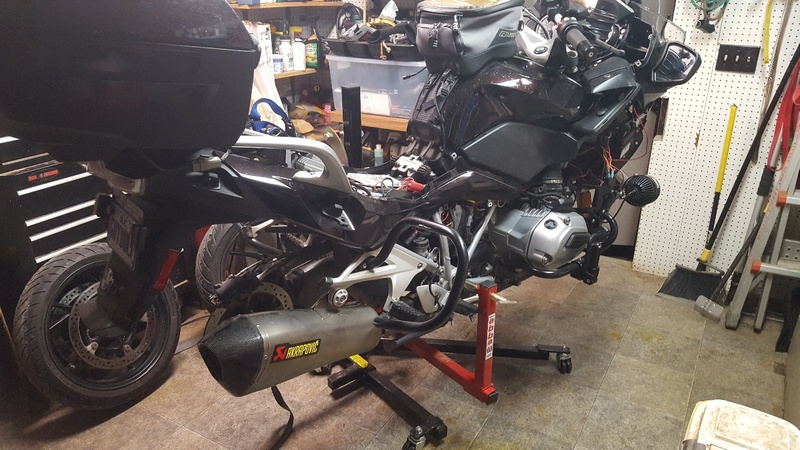 My preferred option is to buy a BMW specific single sided rear bike stand from Pitbull that works on all left-sided final drives, and an adjustable front wheel stand from them. Spendy, but if you are trying to save money in the long run by dismounting your own tires, just do it. Last edited by Rainman48; Apr 5th, 2019 at 4:46 pm. but you can use any sort of block under the front of the engine, or even a jack if you have one. Be careful to keep the center of gravity forward... once you take the front wheel off you do not want it tilting towards the rear. Yes you will have to remove the exhaust and muffler first.. that is easy. Remove the muffler and rear wheel first. Tie the center stand forward to keep it from folding when pushing on the bike. Put a floor jack under the engine(using a small piece of wood to protect) and raise the front. After changing tires out, install the front wheel first then the rear. Since I bought a lift, this is how I do it now. On this picture, the rear wheel hasn't been removed yet, but as you can see it's not touching anything and can be removed easily. 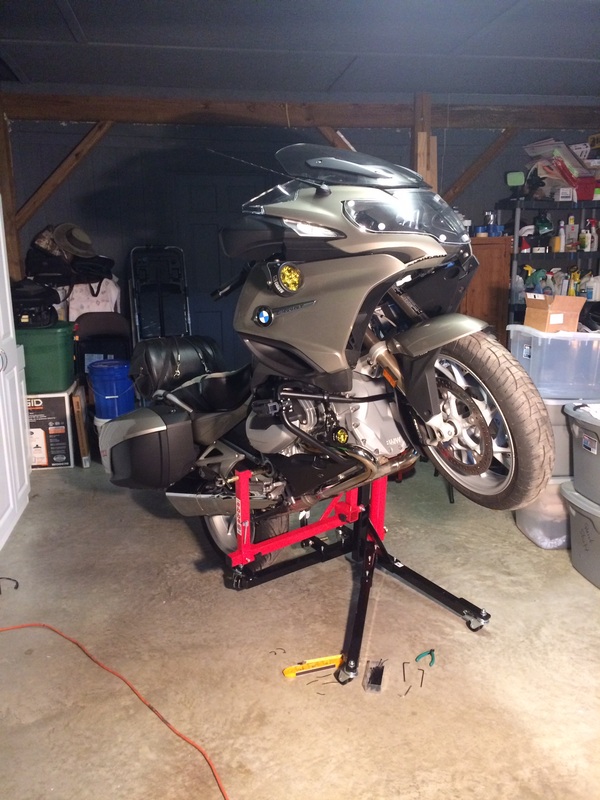 The scissor jack and the center stand support the bike. Works well for me. I remove both wheels all the time when I change tires. wetboxerrt and Goose11 like this. Last edited by Dann323; Apr 6th, 2019 at 9:04 pm. My RT is nose heavy like my 1300GT was, I use this procedure on both of them. Centerstand > 1- 20 pounds of weight in top case. ( front wheel up ) > remove front wheel > reinstall axle > place jack stand under axle > remove extra weight in top case to lower axle on padded jack stand > remove rear wheel. I have used my wife as a counter weight until removal of front wheel complete. I never seen that gadget before, where did you get it? Name?, brand? Model?